My first post on EAC's blog and I'm honoured and delighted to contribute! 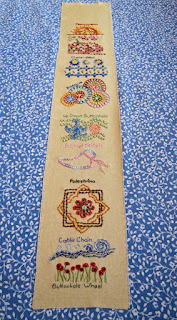 I'm excited to share with you a year long stitching project that I've undertaken. 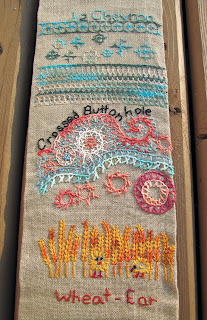 Every Tuesday for the entire year of 2012 I, along with a few hundred others from around the globe are taking part in a stitching challenge called Take A Stitch Tuesday or TAST. I really had no idea what I was getting myself into and that I would be learning so much! First I had to decide how I was going to stitch 52 samples of different stitches. Would I make them into a fabric book, atc's, tags, a doodle cloth or fabric postcards? 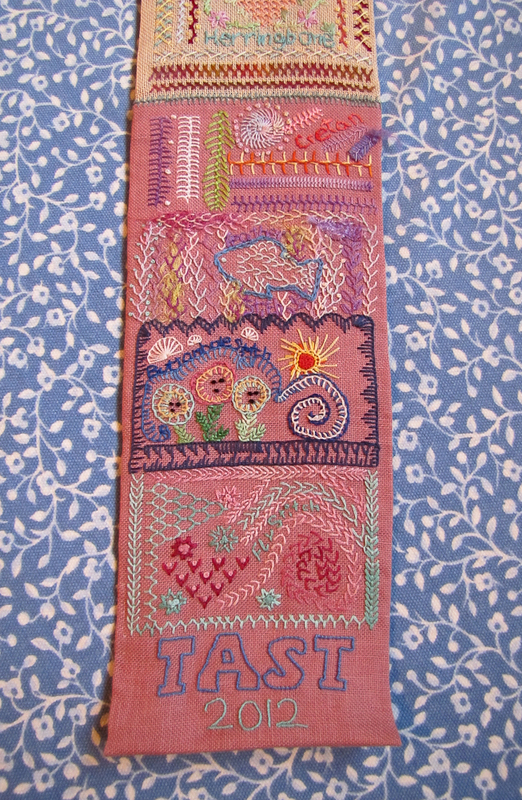 I chose to make a band sampler that's 4 1/2 inches wide and use a variety of fabric pieces. 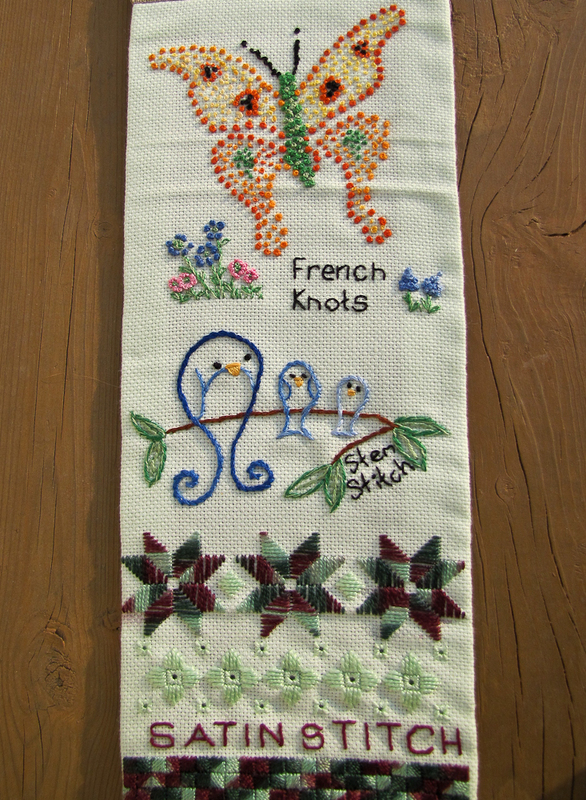 My first foray into the wonderful world of stitching began in my late teens when a neighbour invited me to take a hardanger class with her through the Regina Stitchery Guild. I was immediately hooked and was content for a long time with hardanger embroidery. 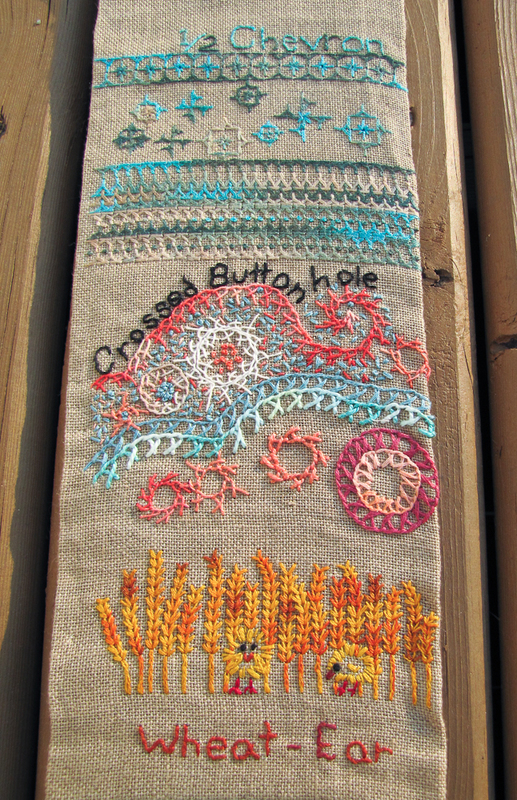 I branched out very slowly with a bit of cross-stitch, blackwork, bargello and canvas work. When I read about this neat sounding project of learning a new stitch every week I jumped at the opportunity. 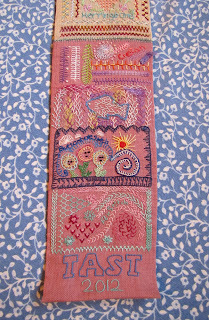 Some of the stitches I knew like the satin stitch, stem stitch and french knots of course. 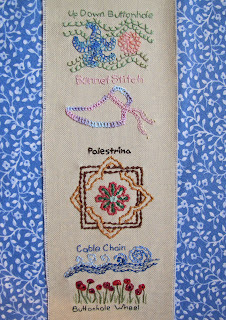 But there have been many that I have not only never stitched before but never knew even existed like the wheat ear stitch, crossed buttonhole and 1/2 chevron. I could have just stitched a few rows of each stitch every week but I wanted to play and be creative as well. 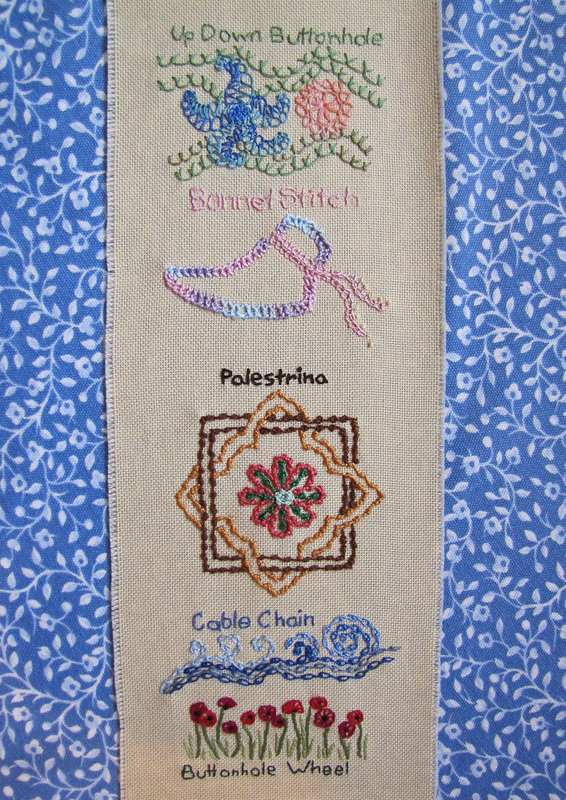 Some have been a bit more time consuming and finicky to do especially when undoing some because I hadn't done them correctly like the knotted cretan and the pekinese stitch. But most of them have been a lot of fun to learn like the cable chain, palestrina, bonnet and up and down buttonhole. After coming to the end of a piece of fabric I hem and back it and am slowly joining them all together as time permits. 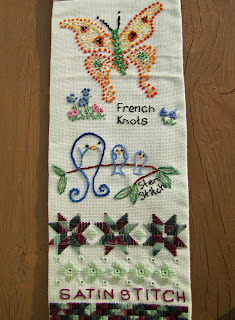 Working all of these stitches into a band sampler makes them very easy to keep and transport as it rolls up so nicely! I also really enjoy making atc's and lately it's been great to unroll my sampler and look at the variety of stitches I've learned and to incorporate some of them into an atc. With the Take A Stitch Tuesday project there is absolutely no pressure to keep up and one can swing in and out of the challenge as time permits. We're on week 34 this week and the stitch is the Linked Double Chain which is yet another one I have never done or heard of! Thanks Mary Ann, I can't get over how many different stitches there are and how much I'm learning! 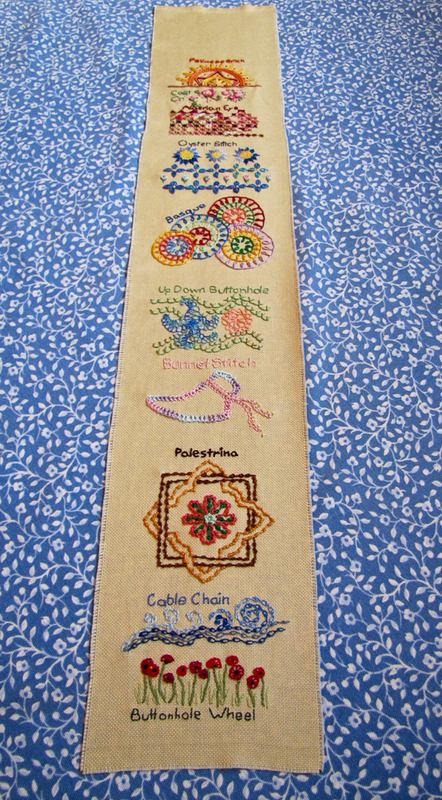 Your stitching is awesome, and you do design the nicest motifs. Recommencing cross-stitching and learning embroidery is on my must-do list, but where does one find the time? How many hours do you need each week for this project? Thanks Regina!! Time is definitely a factor and some weeks I might only do an hour on a stitch and other weeks perhaps 3 or 4. Sounds like a fun project. I like how your band sampler is turning out. This would be a good guild project. Thanks Sue! It has been a lot of fun and I definitely look forward each week to the next stitch. You have accomplished so much. This is a wonderful project. 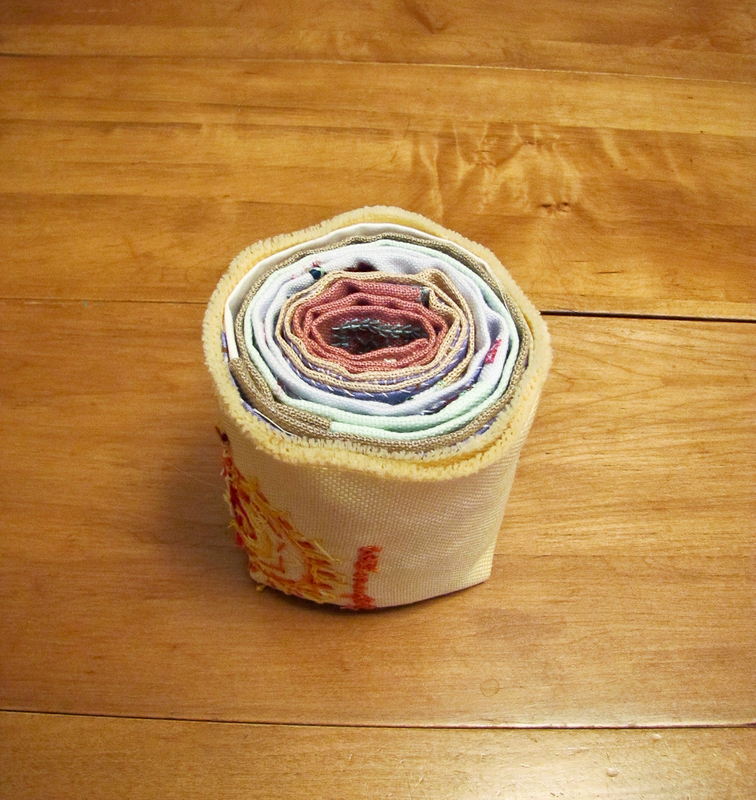 I like the fact that you can unroll it to look at all of your work. Welcome to the Blog Jeannette. I love your piece. I thought about joining in the TAST but it won't be this year.Keep us informed on your progress. What an amazing project! It looks lovely!! 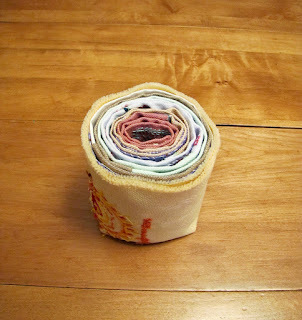 It's fun to unroll now but how will you have it when it's all done. It'll be quite long, I'm thinking. What a great project! I had heard about TAST on another blog. I like the way you are doing a long band that travels easily. Good luck with the rest of the weeks!